This entry was posted on Saturday, February 4th, 2012 at 10:50 and is filed under Barack Obama, Election 2012, Illegal Immigration, Law, Media, News, Politics, Welfare State. 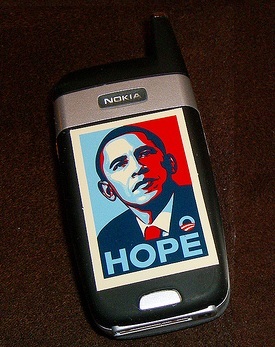 The Western Center for Journalism is reporting that the so-called “Safety Link” program, known widely as the “Obama Phone,” that provides a phone and some number of free minutes to those on various “safety net” programs is now also providing them to illegal aliens in what is clearly a move to buy votes. This is the reason for Obama’s whole “Dream Act via executive order” that is intended to revisit the pending deportation cases of more than three-hundred-thousand illegals now in process. This is a sickening abuse of our tax-payer dollars for what is clearly a partisan political goal, and it should be stopped, but it seems that the only way it will be discontinued is if this president is ushered out of office in January 2013. I would encourage you to see the rest of the article, as it is an eye-opening bit of serious journalism that reveals how far down the rabbit-hole we’ve already traveled. Obama is going to use every device of tyranny to overthrow the coming election, and if he has to employ illegal immigrants to do so, he will. He’s taking no chances, and if we ever manage to get him out of there, and restore our constitutional system of government, this guy and his henchmen need to face charges. It’s well beyond dereliction of duty at this point. So far slow comment day. Hope phones were programmed with "Do not call." I can't even add smiley face to this!!! Be looking forward to your further articles…over and out. I have no printable comment. Come on A. O. Watch…tone it down and comment. I went over and out after 12:05 'cause it was nap time for Bonzo. Wake up!!! Where have I seen that before? I dreamt Dream Act was actually the minutes on Obama Phone to Barney concerning his intended act. As far as ushered out…swept out. as with broom and dustpan rather than held by the elbow and ushered. Dust bin of history. I hope.